Build a couple of airplanes and color them. Be sure to add the appropriate amount of weaponry that your house allows. Set up a couple of targets (action figures, lego forts, bowls, etc.) and launch your airplanes from an area designated as your base. Hold a household flight distance contest. Use masking tape to mark distance and date. Keep them there for a couple of weeks to continue the fun. Feel free to move yours a little further after the kids go to bed. Try multiple folds to explore geometry and physics... and if you don't understand the geometry and physics, fake it. They're kids. They believe anything. Setup a life-like airport experience for your little one including an uncomfortable talking-down to from a slow TSA agent recently fired from McDonalds, families that have never traveled before so they try to bring a two-liter of Mountain Dew through security, the smell of feet that comes with the requirement to take your shoes off, the prerequisite that your child take off all metal items before playing with the planes, then a delay of at least an hour before they are allowed to actually play with the planes, the purchase of poorly made chachkis with the name of your town on them, a lunch of the most fattening food that you can slide down your gullet, the related Tums that follows said lunch, the announcement that you can now begin playing with the planes... but as your little one picks one up there is an announcement of another delay, the eventual ability to play with the planes with the requirement that your little one is forced to sit on half a couch cushion while your largest aunt sits next to him on the other half of the couch cushion while she tells him about her career in call center customer service, the forced viewing of old episodes of Friends, the eventual bumpy landing with a forced wait on the tarmac and the ultimate cab ride home. Junior is going to walk away and say "Look at me, I'm just like Daddy!!" 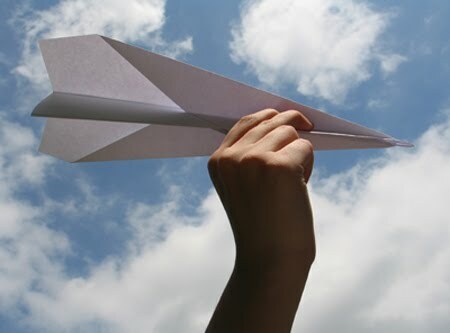 Have any paper airplane ideas to share? Any other penny-pinching-playtime suggestions? Let us know.